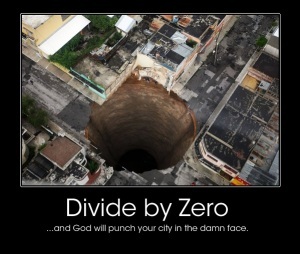 According to the internet hivemind, sinkholes form when you divide by zero. According to Wikipedia, a sinkhole is a depression or hole in the ground caused by some form of collapse of the surface layer, usually as a part of karst landscapes. Most often, water erodes away the stuff underneath for a while before the hole opens up. The ones that make the news are large and usually in the middle of a city, because humans are selfish creatures. Another internet gem. You’re welcome. In the smallest cases, sinkholes can be similar to potholes, where weathering (especially extra rain or crazy freezing cycles) have worn away the sand and other substrates that support the asphalt of the road, allowing the road surface to collapse downward, as happened recently in East Lansing, MI. These range from a few dozen centimeters to many meters in diameter. In the most extreme cases, the “washing away” or even dissolution is happening to the rock below, rather than sand that was carted in, resulting in much more sizable holes, like the “dividing by zero” photo above, a gift from Hurricane Agatha to Guatemala City in 2010. 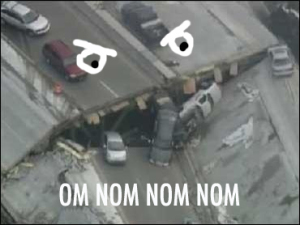 Sinkholes don’t ALWAYS ruin everything we love. 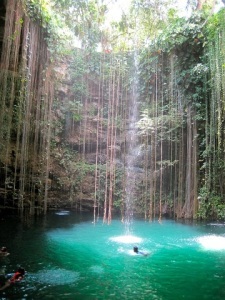 The limestone karst formations in present-day Mexico, called cenotes (sen-OH-tays), are a boon for tourism today, and an important touchstone for the ancient Maya. The Maya in the Yucatan even built cities according to cenote locations, because the people depended on cenotes as the only year-round sources of freshwater, and used them for religious and cultural reasons as well as a smattering of human sacrifice. The caves connecting cenotes have a combination of f low light, low oxygen, and odd separation from other water sources, creating the perfect place for weird critters to evolve. The creatures that live in the “sumberged” (and low-oxygen) seem awfully prehistoric, like the fantastically named Xibalbanus tulumensis (like Xibalba! Didn’t you watch The Fountain? Or pay attention in World History class? Ok, I’m the only one that’s excited, fine), which is also the first venomous crustacean found by humans. Even the fish that stick to the freshwater above are strange, like the Mexican blind brotula that “lost” its eyes and doesn’t react to light at all, but seems to use vibrations to find its shrimp prey, and the blind swamp eel, which lives in sediments and lines its burrows with mucus, like the slimiest sleeping bag ever. The haloclines in cenotes are pretty logical, though, right? Giant underground holes and caverns, full of water, really close to the ocean… it’s not hugely surprising to find them there (limestone is formed by saltwater, after all), or that they’re connected to the currently-existing ocean. But what about an area that hasn’t had saltwater in a few hundred million years? Maybe an area known for having the most freshwater on earth? Yes, the North American Great Lakes have a not-so-secret history of being shallow seas back in the Paleozoic Era. These huge salty puddles left massive beds of limestone (and minerals like salt) to be covered up by glaciers a few times. Nowadays, that limestone is getting slowly washed away in groundwater movement, forming, you guessed it, weird karst formations! Sinkholes, caverns, and all manner of nifty geological things, like collapsed earth under barns and lakes that occasionally drain themselves. Seriously, go back and browse that karst link, it’s bonkers. Anyway, the karst in northeast lower Michigan is especially interesting because it links to more sinkholes… but instead of the ocean, they end up below the second largest (by surface area) of the Great Lakes, Lake Huron. Weird. What’s even weirder is what happens in those submerged sinkholes (definitely peruse this link too!). The water that comes into the submerged sinkholes from other parts of the karst landscape is “cold, oxygen-poor, and ion-rich,… denser than normal lake water, and forms a distinct layer on the lake floor that is as much as 5 m thick” (Biddanda et al. 2012). Holy crap! Who was expecting a layer of cold salty water at the bottom of the third-largest freshwater lake in the world? Not me. All that weird stuff together creates a habitat where normal lake-dwelling organisms have a pretty hard time living. This results in weird mats of microorganisms that are probably totally ancient and definitely very awesome. Some do photosynthesis (right, ok, that’s normal), and others use carbon or even sulfur to get their energy (Whaaaaat?). Sometimes the impacts of sinkholes on human life are more indirect than draining lakes, gates to the underworld, and roads that aren’t there anymore. They can even be sneaky! For example, those ancient shallow seas that chilled out over much of North America in the Paleozoic happened to leave a sizeable chunk of salt in the Detroit-ish area of Michigan. Though many Detroit residents haven’t heard of it, the Detroit Mine has been operating for over 100 years and still going strong,and it’s not exactly small. 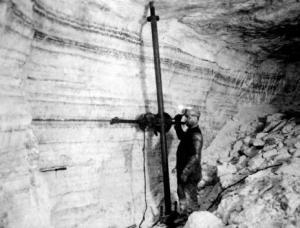 That same salt under the surface can get washed away, and it can happen a lot faster than limestone. And remember, boys and girls, dissolved minerals of any kind can totally turn into sinkholes, which is what happened at Hennepin Point on Grosse Ile in 1971. The salty water in the Hennepin Point sinkholes didn’t spawn a crazy new species of worm-fish or awaken ancient microbes. However, in the early 1990’s, nearby residents were getting mosquito bites as late as Halloween, and were really confused about it. Usually, there’s been a frost or two by that point, allowing the trick-or-treaters to frolic about bite-free. A few landowners were concerned enough that they called the mosquito experts from Michigan State University, Dr. Merritt, Dr. Walker, and then-student now-Dr. Strand. These scientists (who ended up teaching my brother and I at separate universities and telling us the same anecdote 3 years apart) found not Culex pipiens or Aedes canadensis, which are species of mosquito that are pretty normal in the Detroit area. Instead, Dr. Walker found that the salty sinkhole “ponds” had attracted the eastern salt marsh mosquito (Aedes sollicitans) to breed. These skeeters are most commonly found on the Eastern Seaboard, not next to the huge freshwater reserves of the Great Lakes! Nowadays, the Hennepin Point sinkholes-turned-saltmarshes have been filled in, but there are plenty of other sinkholes around the world to study and explore. I didn’t even get to the cool karst landscapes in Thailand, Slovenia, and Missouri! A great way to start getting excited is Planet Earth: Caves (seriously, I could watch it on repeat). The news is also full of sinkhole stories (especially now that US election season is over); that way you can move from “WHO DIVIDED BY ZERO” to the underlying mechanisms, and maybe even learn about local culture while you’re at it. Sinkholes! Gateway to the earth, gateway to learning. Copeland, RS and ED Walker. Sewage-associated breeding of Aedes dorsalis and Aedes sollicitans in southwestern Michigan. Journal of the American Mosquito Control Association 1986; 2:91.